It is finally here-- the January Pattern! As I know I have mentioned about a million times, I love Star Wars! 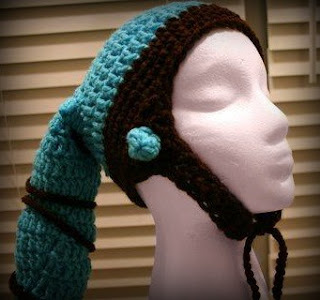 I was trying to think of a creative way to make a Star Wars hat (because I totally love the little droid and Yoda hats some people have made) and then it hit me-- a Twi'lek! 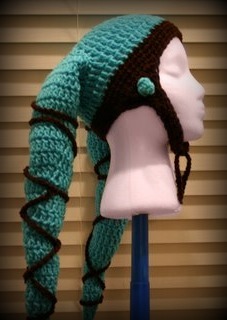 I crocheted a hat to look like Aayla Secura, a Twi'lek Jedi Knight. I used Red heart for this project because it kept the shape nicely. I also used a size G hook. Round 1: DC in 3rd chain from hook 9 times, slip stitch into chain 3 to end round. Round 2: Ch 3, DC in same stitch. 2 DC in each stitch around, Join with a slip stitch to end round. Round 3: Ch 3, 2 DC in next stitch. *DC in next stitch, 2 DC in next stitch* around. Join with a slip stitch to end round. Round 4: Ch 3, DC in next stitch. *2 DC in next stitch, DC in next 2 stitches* around. Join with a slip stitch to end round. Round 5: Ch 3, DC in next 2 stitches. *2 DC in next stitch, DC in next 3 stitches* around. Join with a slip stitch to end round. Round 6-9: Ch 3, DC in each stitch around. Join with a slip stitch to end round. End off. Round 10: Join brown yarn in last DC. Ch 1, sc in each stitch around, Join with a slip stitch to end round. Round 11-12: Ch 1, sc in each stitch around, Join with a slip stitch to end round. 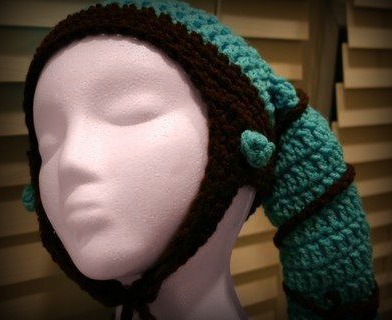 At this point in the pattern you will be starting the first earflap. Ch 1, sc in next 9 stitches. *Ch 1, turn. Sc2tg, sc in each stitch up to last 2, sc2tg* Continue until there are only 2 stitches left. *Ch 1, sc in next stitch, turn* until the strap is long enough to reach halfway around your chin. End off. At this point in the pattern you will be starting the second earflap. Fold the hat in half and attach your yarn in the stitch on the other side of the hat that lines up with where you started the first earflap. *Ch 1, sc in next stitch, turn* until the strap is long enough to reach halfway around your chin. DO NOT END OFF! Slip stitch in between the 2 stitches at the end of the side of the chin strap you are on. Ch 1, sc twice in same stitch. SC down the edge of the earflap, around the hat and up the next earflap. Once at the end of the chin strap, slip stitch in between 2 stitches. Ch 1, sc twice in same stitch. SC down the edge of the earflap, around the hat and up the other side of the other earflap. Join with a slip stitch. Round 1: Ch 3, DC 4 times in 3rd Ch from hook. Join with a slip stitch to end round. Round 2: Ch 3, DC in same stitch, 2 DC in each stitch. Join with a slip stitch to end round. Round 3: Ch 3, DC in next stitch and in each stitch around. Join with a slip stitch to end round. Round 4 - 25: Ch 3, 2 DC in next stitch. DC in each remaining DC. Join with a slip stitch to end round. Now you can stuff the Lekku. You can use regular stuffing, but I used some strips of quilt batting that I had. 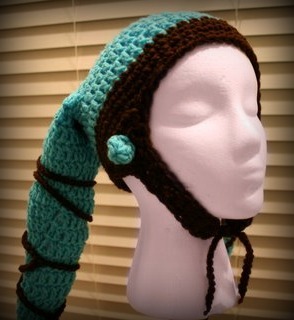 Now use a yarn needle and blue yarn to sew the Lekku onto the hat. They should be sewn more to the back so that they hang down rather than to the sides. DC 6 times in 3rd chain from hook. Slip stitch in Ch 3 to join. Now sew the ears onto the side of the earflaps. Now wrap around the Lekku, you should be able to wrap all the way from the top down and halfway back up. I recommend gluing the wraps on, as they do not stay in place if you just tie them on. Attach the brown yarn to the end of the chin strap and chain 10-20, depending on how log you think it needs to be. End off. Repeat on other chin strap. And NOW-- You are done! This hat was so much fun to make--- I hope you have as much fun making them as I did! As always, if you have any questions, find any mistakes, ect... just let me know! Enjoy! And-- May the Force be with you! I love the hat! I wear it practically everywhere and now that I see the instructions I realize just how much work went into this. It's amazing! thank you so much! awesome Idea!!! This could be my next project :D Thanks for the Instructions. 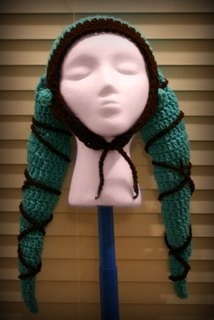 I so want to make this, but I'm a knitter. Boo, but yay I'm going to attempt one anyways in knit! hooray! Now I know what I'm going to be for Halloween this year! someone in the dallas area teach e to crochet so i can do amazing things like this!!!!! Thank you for creating this! 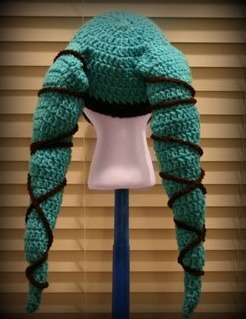 I have always wanted to be a twi'lek for Halloween, but making the lekku looked SO complicated. This will be much easier. Fantastic job!!! How many hours do you think did it take you? I usually stick to "easy" patterns so I was wondering if it might be too advance for me. Not sure what I am doing wrong. I started to try this in hook G, now I am trying hook H and it is just not as big as yours is. Are you doing this in 2 strands or what am I doing wrong?? 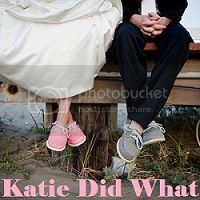 Glad I'm not the only one wondering this! I'm using a G hook, red heart yarn and before doing the ear flaps it barely would have fit my 5 year old! Please help us. I noticed this as well for me, my problem, however is a simple fix. I have a big head, like 26inch circumference big, and so when I made the hat the first time, it was too small for me, so this time I am making it in my hat size, following her instructions after I make the initial hat. But that's just me. I hope this provides some answers! Awesome design by the way, I am totally hooked on making these! I am working on making one in every colour of the rainbow! Haha! I have someone who wants this for a 2 year old. Might be able to figure it out myself but do you, by chance, have the pattern already in a toddler size? My sister and I are going to gncon this year and I am making us each one of these hats. So excited! What a great pattern. 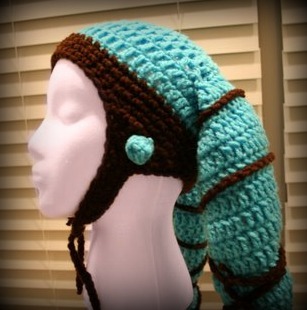 Wonder if this could be modified to make a Togruta headpiece instead? 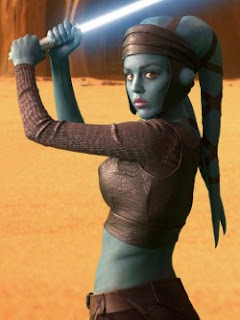 (think Ahsoka, Clone Wars??) Dying for a Togruta pattern but this is the closest I've come. can someone please translate this into german for me? Do you think this pattern could be changed to fit a 4 year old? Have something to say? Leave me a comment- I love hearing from you! Egg Cozies-- Adorable or Pointless?